Problems with bowing, leaning, and cracking foundation walls, if not addressed, will ultimately lead to a “point of no return” for the wall. (This is an excellent reason to fix problems as early as possible!) Many homeowners are dealing with walls which have essentially failed. At this point the homeowner is at risk of losing all of the value of their property. If the walls are so severely damaged that they cannot be stabilized and straightened with beam braces, the only option is to rebuild the failed wall. 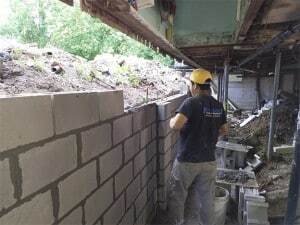 This starts with first stabilizing the home, as the damaged portion of the foundation wall is likely not providing sufficient support to that part of the structure. Once the structure is fully stabilized, the next step is to remove the failed wall. Given no equipment can be brought into the basement, all materials must be removed by hand. As you might imagine, this is an extremely time consuming process and must be managed with a high level of focus on safety. Once the damaged wall is removed, a cinder block wall can be rebuilt in its place. We have skilled masons on our team who can professional rebuild walls. This type of foundation repair requires a higher level of skill and is the type of job that many less experienced foundation repair companies will pass on due to its complexity. The team at Foundation 1 has the skills and experience to do this job and help the homeowner preserve the value in the home. Contact Foundation 1 for a free evaluation, including if your home has serious wall damage, collapse, or pending failure. As you might imagine, time is of the essence with this type of project, so contact us today.